IMPORTANT NOTE: These instruction apply only to POV-Ray 3.1. They do not apply to POV-Ray 3.5 nor any newer version, as radiosity has changed quite a lot since 3.1. 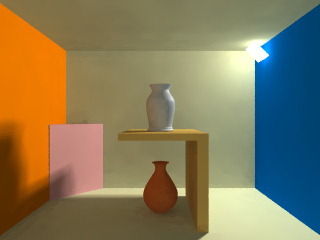 I'm not a POV-Ray radiosity expert, so don't consider this a complete tutorial about radiosity. This text only contains some things about my experiences about the radiosity of POV-Ray. Since it seems to be a non-trivial task to get the right settings for a specific scene, this may help a little. 1st rule: Choose your ambient light carefully. The settings into the radiosity-block in global_settings are not the only things that affect radiosity calculations. The ambient light plays a very important role in radiosity. It seems to be a very common mistake to think that the ambient setting in the global_settings block is a substitute of the radiosity and that when you use radiosity, you should set the ambient to 0. I understand this because I thought this too when I first used radiosity. Actually the ambient level of the objects is essential for the radiosity calculations. If you set the ambient of an object (or the whole scene in the global_settings block) to 0, this means that object will not illuminate its surroundings (ie. it will not reflect light). If you set it to 0, you are actually telling to povray "this object doesn't emit ambient light" which is the same as "don't calculate radiosity for this object". Radiosity is in fact just a more advanced way to calculate the ambient light. Note that this will make the objects much brighter than usual. Objects will actually glow light. This means that they will emit light to their surroundings even if there are no light sources in the scene. I used this trick to enhance the radiosity. It may be too bright for some scenes so you'll have to experiment with proper values. This can be used to make "fake" light sources, ie. objects that emit light. If you set the ambient level of an object to 1 (or more), it will be very bright and it will emit light to its surroundings. This can be used to make true area lights (as opposed to the fake area lights of POV-Ray). I didn't use this technique in these scenes but used an area light source mainly because the bright object has to be very big to really affect the scene. You can see this effect in the 3rd test image (it would have worked if I had set the ambient light of the circular object much brighter instead of illuminating it with a spotlight). Using light sources has the advantage that you get good shadows and highlights without having to set extreme radiosity values. 2nd rule: Don't make your room too big. About 20 POV-Ray units is ok.
You should always confine your radiosity scene inside a closed room. Radiosity usually doesn't work very well in outdoors scenes. I once tried the same settings as in these scenes with an outdoors scene, and the image was really awful. It looked like an extremely overexposed photograph. If you ever need radiosity for an outdoors scene, you should try with a lot less bright settings. For some (perhaps technical) reason, the size of the room is important. I really don't know why, but this seems to be the way it works. Tip: Don't use a room much bigger than about 20 POV-Ray units. The room I used in these scenes is a box of size <-11,-8,-18>,<11,8,11>. I have tried with very big rooms and it seems impossible to find the right radiosity settings. You always get blotchiness or graininess and annoying dark spots in the corners. I have not tried with very small rooms. The scene renders pretty fast (56 seconds in a P-II 350MHz with antialiasing 0.1) but there's visible blotchiness. We see that the actual radiosity settings are not so important as you could have thought. Just with proper ambient light settings and a room of a proper size we get quite acceptable radiosity with the default settings and pretty fast. count: POV-Ray sends many rays to every direction from each point to see what's illuminating that point. The amount of rays is set with this keyword. In a perfect world it would be almost infinite, but we have to limit it to a realistic value which doesn't take forever to calculate. This value depends on the size of your objects. If you only have big areas of color in your scene, you will not need so many rays, but if you have many small colored objects, you'll need a larger value (so that the chance of hitting the nearby objects get bigger). I used count 500 for these scenes. A smaller value (like 300) could have been enough, though. distance_maximum: This setting depends on the size of the room and the objects inside it. The meaning of this setting is detailedly explained in the documentation so I will not say it again here. I have noticed that the rule "use a distance_maximum which is a little smaller than your smallest meaningful object" is quite good. By meaningful object I mean an object which essentially affects the lighting of its surroundings (like the brown jar). I used distance_maximum 1 for these scenes. error_bound: As with distance_maximum, the meaning of this setting is better explained in the documentation. I don't know exactly what does it mean, but I know that the smaller the better (and slower); with large values you get visible errors. The default value is 0.4 but I used the value 0.2 for these scenes (although the docs mention that it may take forever). minimum_reuse: Again, read the documentation. In this scene with the default value 0.015 we still get some blotchy spots in the corners. Setting this value to 0.01 gets rid of this. The other settings are just for fine-tuning the radiosity and they don't have so drastical consecuences. Adjusting them you get slightly better radiosity, though. Specially the recursion limit may affect the quality of the radiosity (as you can see in the test images). See the documentation for more help about them.